Safety Culture is loosely used to describe the corporate atmosphere or culture whereby ’Safe Production is understood to be, and is accepted as, the number one priority’ and is often defined as ’the way we do safety around here’. A company’s safety performance is strongly linked to its safety culture. Safety culture can be divided into three aspects: psychological, behavioral, and situational . The psychological aspects dictate how people think and feel about safety, and is usually referred to as winning over people’s ‘Hearts & Minds’ to the safety cause. The behavioral aspects comprise of people’s everyday actions in regards to safety. The situational aspects cover the safety management systems that a company uses to set the guidelines for what people should do in various circumstances. These three aspects are inter-related: what happens in one aspect influences the other two. The Business Process Model uses these three aspects to illustrate that the Inputs are processed by a combination of the company’s goals, expectations, and management practices, and Transformed into the safety culture Output to create the safety culture Outcome. The Transformation Process shows that the company goals, expectations, and management practices demonstrated by the Company's Leadership are the key aspects for creating and maintaining a positive safety culture. Truly measuring safety culture often requires the use of more than one method (e.g. focus group exercises, observations,, safety system audits and Safety Culture Maturity assessments) each of which would broadly focus on the same topics associated with Incident Causation (e.g. senior management commitment, line-management actions, supportive actions, on-the-job behaviour, incident reporting and corrective actions). Ideally, data should be collected for all methods used at more or less the same moment in time, as one method helps to validate another. Each method provides a different assessment perspective. In essence, these attempt to establish a baseline (beginning benchmark) by which future efforts can be compared or evaluate whether  the safety culture has changed for the better and  How do we know? As safety culture experts, we can assess your safety culture using all the methods available, separately or in combination, to provide you with an effective and focused path forward, to put you on the right road to achieving a world-class safety culture. The results of public enquiries into major industrial safety disasters have identified that a positive ‘Safety Culture’ is the missing link between the presence of safety systems and actual safety performance. In response, government regulators and industry associations (e.g. BSEE , DOT , FAA , NRC , OSHA , HSE , CANSO , PSAN , IOSH ,) are heavily focusing on Safety Culture. They recognize that achieving world-class safety performance involves more than mechanically applying a management system: it requires the involvement of everyone in a company, from top to bottom, directing their efforts at continual improvement. 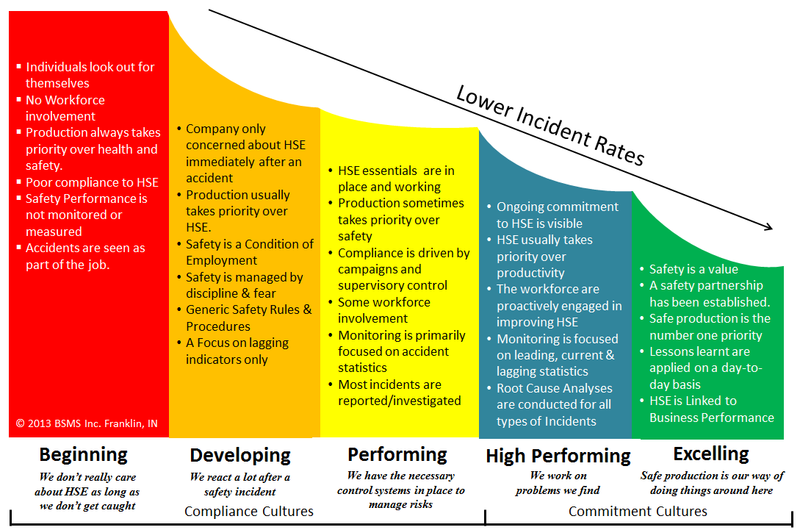 The best way of knowing the status of your current safety culture is to assess it, and compare the findings against a maturity model of safety culture that is linked to actual safety performance. Building on the developmental work performed by researchers from the British Health & Safety Executive with 2,500 companies which began in 2007, BSMS have refined the original model from its work performed in a variety of countries and industrial sectors: we developed norms, and produced 'curve' scores to facilitate bench-marking between companies and sectors. Using Two-Hour Focus Groups exercises in a company over the course of a day or two, with 25-50 attendees at each, the responses are collated, analyzed and written up as a report by BSMS that provides direction to the way forward to maximize the benefits. BSMS Inc have the practical and academic experience to help you holistically assess the maturity of your Safety Culture to arrive at tailored solutions. In partnership with clients, we create sustainable, long-term results by using best 'management of change' practices, developing milestones and measurable Key Performance Indicators. The benefits of assessing your Safety Culture can be enormous: They can help you identify your current strengths and weaknesses, create tailored strategic improvement initiatives; develop site specific improvement plans; and track your progress to safety excellence. In turn, these help you improve your overall safety performance. Download our Safety Culture Profiling Brochure and start the process of engaging us to help you. Safety Culture is a complex topic, and most companies do not understand their cultures well enough to succeed with safety culture changes and the challenges this can create. Our professional services are based on our unique, integrated Safety Culture Profiling method that focuses on the interactions between Safety Management Systems, Safety Behavior and people's Hearts & Minds, which together forge a company's Safety Culture. The ﬁnancial beneﬁts to be gained from assessing and improving your safety culture can be immense. It can lower incident and absenteeism rates, reduce insurance premiums, and help to improve productivity, quality & proﬁtability.